Vineland senior guard D.J. Campbell, who led South Jersey with a 29.4 scoring average, is the Group 4 player of the year. Player of the year: D.J. 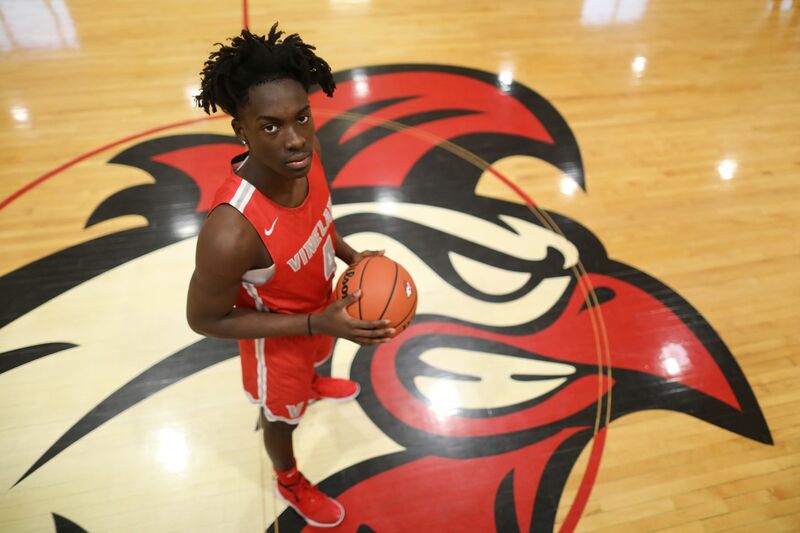 Campbell, Vineland: The senior guard, who didn’t start playing organized basketball until ninth grade, led South Jersey with a 29.4 scoring average. The 6-foot-2 Campbell could get to the rim and also score from distance. He made 92 three-pointers and 147 free throws, a sign of his ability to get to the rim. Campbell finished as Vineland’s all-time leading scorer with 1,353 points. He scored 30 or more in 11 games, including 50 in a victory over Atlantic City. Cherokee coach Eric Cassidy, celebrating with senior Olare Oladipo after the South Jersey Group 4 title-game win over Millville, is the Group 4 Coach of the Year. Coach of the year: Eric Cassidy, Cherokee. In his fourth season at Cherokee, Cassidy led the Chiefs to the South Jersey Group 4 title. Cherokee also won the Olympic American title with an 8-0 mark. The Chiefs were a balanced team that shared the basketball and played strong defense. Seniors such as Anthony DiCaro, Olare Oladipo and Damian Smith displayed an unselfish, team-first attitude that reflected the culture created by Cassidy and his assistants. In four South Jersey tournament games, Cherokee held opponents to 38, 38, 47 and 40 points, respectively, in capturing the program’s first sectional title since 2010. Honorable mention: Little John Green, senior, Millville; Javontae Jones, junior, Rancocas Valley; Noah Klinewski, junior, Eastern; Justin McNichols, junior, Clearview; Derek Simpson, freshman, Lenape; Damian Smith, senior, Cherokee; Zion Teague, senior, Atlantic City. Player of the year: Nick Cartwright-Atkins, Moorestown. The 6-0 senior swingman set the pace for the Group 3 state champions. Cartwright-Atkins averaged 14.7 points and eight rebounds with 90 assists. But statistics don’t reflect his full impact. He was the hub of the Quakers’ attack, consistently battling taller players in the paint and creating openings for the team’s army of three-point shooters. Moorestown's Nick-Cartwright-Atkins (right) is the Group 3 player of the year. Cartwright-Atkins, who has signed to play football as a wide receiver at Wagner University, was at his best in the state tournament. He scored 12 points with 13 rebounds in the state final victory over Ramapo, which was led by 6-11 Neal Quinn. Coach of the year: Shawn Anstey, Moorestown. In his 10th season, Anstey led the Quakers on a historic run. Moorestown won a state title for the first time in 60 years. The Quakers played the game with precision, sharing the basketball on offense and playing with focused diligence on defense. Moorestown coach Shawn Anstey, who led Quakers to their first state title in 60 years, is the Group 3 coach of the year. Despite a lack of overall size and the absence of a single athlete who is likely to play basketball in college, Moorestown won the state title in emphatic fashion – beating Central Jersey champion Wall in the state semifinals and North Jersey champion Ramapo in the state finals by a combined 34 points – then stunned Group 2 state champion Haddonfield in the first round of the tournament of champions. Honorable mention: Kobey Evans, senior, Delsea; Akhil Giri, senior, Moorestown; Donovan Graham, senior, Ocean City; Johnny Kennevan, junior, Seneca; Bobby Mullan, junior, Highland; Demetrius Paynter, junior, Timber Creek. Player of the year: Mike DePersia, Haddonfield. The 5-11 senior guard led Haddonfield to its second straight Group 2 state title. DePersia, an Indiana University Purdue University Indianapolis (IUPUI) recruit, averaged 13 points per game but specialized in controlling the tempo of games, getting the Bulldawgs into their offensive sets and making smart decisions in pressure situations. Haddonfield's Mike DePersia, who led the Bulldawgs to back-to-back Group 2 state titles, is the Group 2 player of the year. He was most valuable during the state tournament, handling full-court defenses from Camden and Newark West Side as Haddonfield defended its state crown. In the final against West Side, DePersia scored 16 points with three assists, making several clutch plays in the fourth quarter, including a key three-point jumper as well as a traditional three-point play. Coach of the year: Paul Wiedeman, Haddonfield. In his 20th season, Wiedeman won his fifth state title and second in a row. Wiedeman led an accomplished, experienced, senior-heavy team to a 31-2 mark, tying the school record for victories in a season. The Bulldawgs never lost their focus and intensity, going 7-1 in eight games without DePersia, who missed time with a wrist injury, and showing remarkable poise in tough situations. Haddonfield's Paul Wiedeman, who led the Bulldawgs to the Group 2 state title for the second year in a row, is the Group 2 coach of the year. Haddonfield trailed West Deptford by 23 points in the regular season and rallied to win and trailed Camden, its top rival, by 11 with less than two minutes to play in the sectional final, rallying to win in overtime. Honorable mention: Jalen Freeman, senior, Pleasantville; Dylan Heine, senior, Haddonfield; Chad Howard, senior, Cinnaminson; Jordan Martin, junior, Bordentown; Brandon Ratcliffe, junior, West Deptford; JP Rickus, senior, Cinnaminson; Jay White, senior, Pennsauken Tech. Player of the year: Deonte Woodbury, Burlington City. The 6-1 junior guard led the Blue Devils to the Central Jersey sectional title as well as a victory in the state semifinals and berth in the championship game at Rutgers. Woodbury, who also is a top wide receiver in football, averaged 18.1 points per game. He was remarkably consistent, scoring in double figures in every game. Burlington City junior Deonte Woodbury, with coach Paul Collins, is the Group 1 Player of the Year. Woodbury scored 17 points in a victory over top-seeded Willingboro in the sectional finals and 19 in the loss to New Providence in the state finals. Coach of the year: Frank Rago, Clayton. The Clippers’ coach is an iconoclast, employing a “Tornado” style of play that features a frenetic pace, lots of substitutions and non-stop defensive pressure. Nobody plays like Clayton. The Clippers topped 85 points in 14 games this season. They had three different players with 500 or more points. Clayton head coach Frank Rago (right), who led the Clippers to their first sectional title since 1980, is the Group 1 Coach of the Year. They also were champions. Clayton won its first South Jersey title since 1980 with a victory over Wildwood in the sectional title game. It was a special moment for the oft-overlooked program and validation for Rago, whose unique style of coaching brought a championship trophy home to the tiny school in Gloucester County. Brian Burns, 6-1 senior, Haddon Twp. Honorable mention: Nazim Chavies, junior, Willingboro; Michael Green, senior, Burlington City; Jamar Johnson, junior, Penns Grove; Joshua Jones, senior, Clayton; Zach Manorowitz, junior, Pennsville; Kyree Myers, senior, Glassboro; Jaylen Newton, junior, Penns Grove. Player of the year: Taj Thweatt, Wildwood Catholic. The 6-7 junior swingman led the Crusaders to the best season in modern program history. Thweatt averaged 20.7 points and 10.2 rebounds as Wildwood Catholic went 27-2, capturing its second consecutive Cape-Atlantic League title. Wildwood Catholic junior Taj Thweatt (left, with teammate Jacob Hopping) is the Non-Public player of the year. Thweatt took a major step forward as a junior, developing more of a perimeter game to complement his ability to operate in the post. He made 27 three-pointers this season, several at key moments of big games. Thweatt led Wildwood Catholic to the brink of perhaps the biggest upset of the state tournament in all groups. He scored 13 points with 14 rebounds and was a huge defensive presence as Wildwood Catholic pushed Ranney School, the consensus No. 1 team in the state and the No. 10 team in the country in MaxPreps’ Xcellent 25 national rankings, to the brink before losing, 54-50, in overtime in the Non-Public South B final at Jackson Liberty. Coach of the year: Dave DeWeese, Wildwood Catholic. DeWeese loaded up the Crusaders’ schedule this season, challenging his young team to raise its game and become one of the state’s top squads. With just one senior in the regular rotation -- point guard Jake McGonigle -- Wldwood Catholic handled nearly every challenge. The Crusaders went 25-1 in a grueling regular season that included nine games against teams that finished in the Top 10 as well as several battles with out-of-area powers. Wildwood Catholic's Dave DeWeese, who led the Crusaders to a 27-2 record and the No. 1 spot in the final South Jersey Top 25, is the Non-Public Coach of the Year. DeWeese’s team went 9-2 in games decided by nine points or less and never wavered in its defensive diligence. The coach said his team had a “calm confidence” that enabled the Crusaders to rally in tough situations, a tribute to the athletes but also to their coach. Honorable mention: Gianmarco Arletti, junior, Holy Cross; Corey Blackwell, senior, St. Joseph’s; Jalen Boyd-Savage, sophomore, Paul VI; Pat Corbett, senior, Camden Catholic; David Cross, junior, Bishop Eustace; Andrew Delaney, senior, St. Augustine; Zach Hicks, 6-7 sophomore, Camden Catholic; Wisler Sanon, sophomore, Paul VI; Nick Saint-Juste, senior, Doane Academy; Jack Stern, Moorestown Friends.